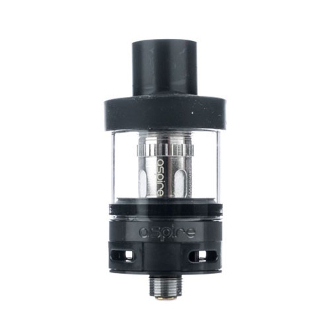 The Atlantis EVO Tank is a small 2ml tank that has all the power and performance of a full sized tank. The reason the Atlantis EVO is so small is so that it can comply with TPD Rulings, Making it custom made for current market conditions! The Atlantis EVO also was built while keeping the popularity of VG e liquid in mind. Everything about this tank is designed for vapers to have the best cloud chasing experience they can achieve. Because sub ohm devices are known for going through e liquid faster, they decided to add some very convenient features. One of them being the EVO’s top fill method where you simply unscrew the top cap to have access to its 2ml capacity chamber. The Atlantis EVO sports a Delrin Drip Tip which gives the user an easier feel for their mouth when having a direct lung hit. It also helps for a smooth and less heat filled vapor. While the Atlantis EVO tank can work with Atlantis replacement coils and Triton Atomizer Heads, there are two new coils exclusively made for this Tank: the Kanthal Clapton 0.4 Ohm and 0.5 Ohm. Both of these coils have extended bottom juice holes which keep the tank vaping without a hitch. It also minimizes harsh tastes and burnt flavorings by keeping the internal wicking constantly saturated. At the bottom of the tank is a fully adjustable quad airflow. That means that there are four air holes at the bottom of the tank where the user can decide exactly how much airflow and resistance they are receiving through the tank.